The Arts and Crafts Project aims to teach the children at SHCC a range of skills including drawing, painting, basket weaving and frame making, just to name a few. We have also just started making art out of recyclable rubbish. Whether planters, pots, skipping ropes or ornaments, the children are very inventive! We also teach traditional Apsara dancing. Basket waving is a traditional handicraft renowned throughout Cambodia, but in particular the Siem Reap province. Learning the traditional skill has economic benefits as well as helping to preserve the local culture. SHCC students have the opportunity to develop skills in basket weaving at SHCC. A local teacher passes on their knowledge, enabling the students to then weave baskets to generate the much needed income to help support their families and their studies. SHCC through support from local community members will develop the basket weaving programme and co-operate with local traders to sell the baskets on the student’s behalf. 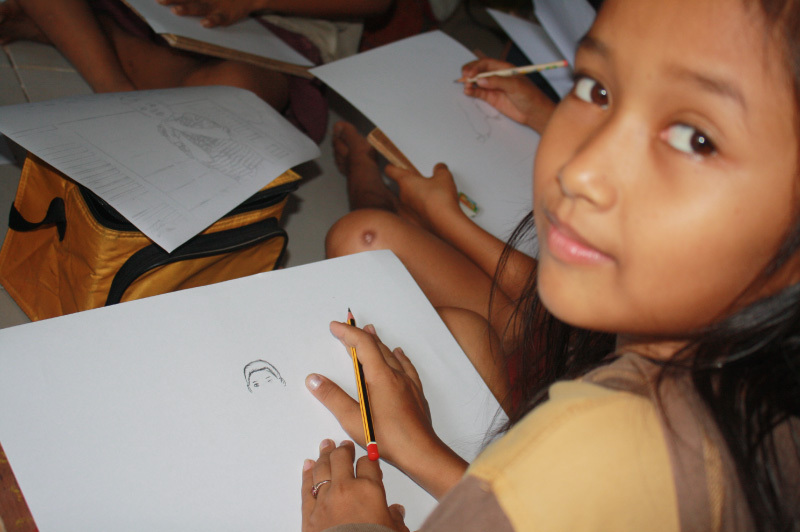 We have many talented students and aspiring artists at SHCC and once a week these children attend a specialist art school in Siem Reap. To provide continual education in Arts & Craft at the school, with skilled staff. Community through education and empowering the members of the community to sustain their own livelihoods. Government Organisation through the production of crafts to sell at the local market. 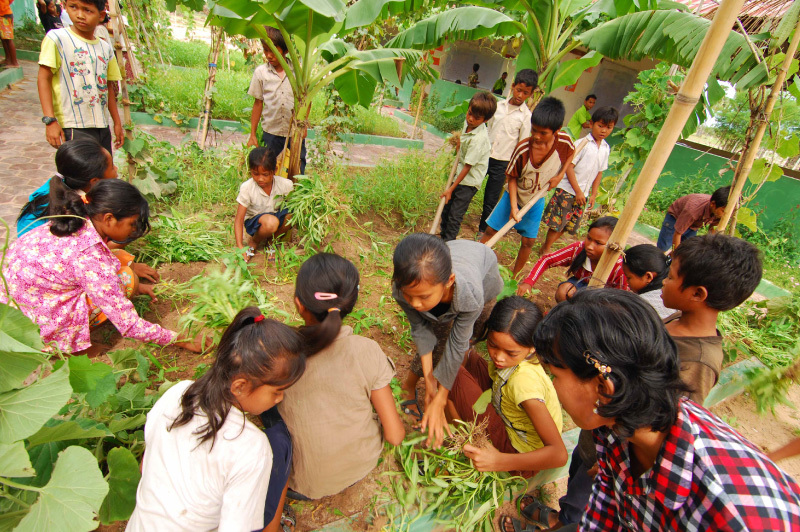 The SHCC have developed an Organic Farming Project aimed at promoting self-sufficiency and sustainability at the SHCC School and for the families living within the Kro Bei Riel Community. The first phase of the Project was the construction of an organic farm at the SHCC premises in Totea Village. The second phase was to select 12 students from the 12 villages within Kro Bei Riel Community and to then teach these students about farming, sustainability and empower them to then pass the knowledge they have gained onto their families and the wider Community. Encouraging them to implement all they have learnt at their own homes and thus providing students with income to help support their families and to put towards their future studies. The underlying purpose of this project is to establish a method of addressing the issues of poverty, lack of funding and education in rural Cambodia. We are currently in the process of expanding our farming project, by constructing a fish farm and a larger farming area at the back of the school. We hope to have this completed by early 2015. The School system in Cambodia offers free Primary School education to all Cambodian children. However, there are no Sports Classes offered as part of the national schooling curriculum. 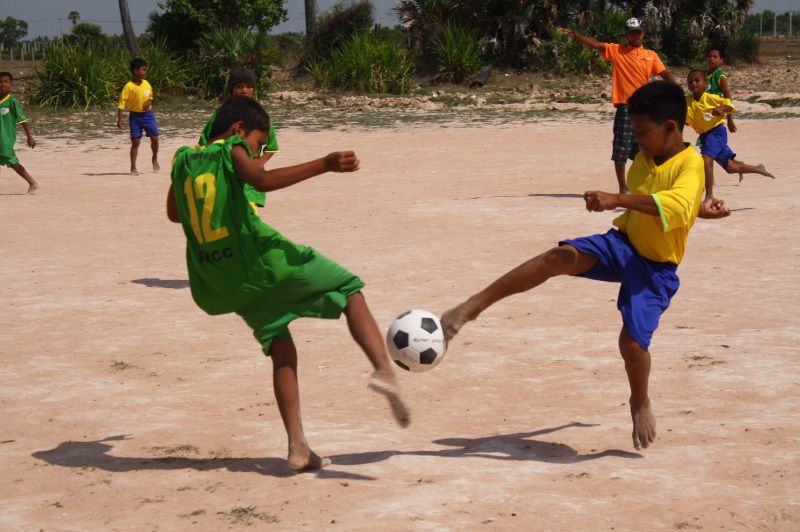 Sports education is offered mostly in town for a fee; therefore, the village children cannot afford to learn and train in sports. SHCC currently offers football and volleyball daily, and when volunteers are available also basketball, badminton and general fitness to the children. As new volunteers come to assist us, they sometimes bring with them both equipment and the skills to teach the children new sports or activities. All classes are taught by Khmer teachers and Khmer trainee teachers, with at times, assistance from International volunteers. Class sizes vary between 10 - 30 students. Each class runs daily from Monday – Friday for one hour. Students range in age from 6 - 16 years. SHCC enters teams in the provincial NGO football league. Each year we are able to enter more teams, in 2014 we were able to enter 7 teams. Every year our teams have great success, always finishing in the top four and each year either our under 12’s or under 15’s have won their championship. The benefits for the children participating in these tournaments are immense, not only for the enjoyment factor, but to experience competition and have socialisation with children outside of their community from other areas within the province.